The bathroom is a natural location for ceramic tiles. Ceramic tiles have long been loved for their beauty and durability. In fact, people have been using ceramic tiles for millennia. For instance, the Romans were famous for installing intricate mosaic ceramic tile designs on their floors, which are often excavated perfectly intact thousands of years later. Talk about a long-lasting material! The Egyptian Pharaohs were probably the first to use ceramic tiles—they decorated their tombs with ceramic tile designs. Today, ceramic tile installation is a great way to revive any room in your home, as tile is available in a wide variety of styles, and may be used in multiple applications. Depending on their size, color, and texture, ceramic tiles can lend a modern air or create a classic ancient feel—the creative possibilities are endless! This article will get your creative juices flowing by offering five uses for ceramic tile. Flooring. Unlike wood, ceramic tile floors will never show wear from foot trafffic. Moreover, ceramic tile can conduct heat, which is perfect for modern heating and cooling radiation systems. (The Romans used this technology as well; they ran hot water underneath the floors of their baths to heat the ceramic tile floors.) Finally, aside from the grout, ceramic tiling is easy to clean, making it a great flooring material. For additional traction in wet areas, install small tiles; the grout will create a non-slip surface. Floor tile installation is a big job, so bring in a trustworthy contractor. If you don’t, moisture could seep through and weaken your home’s supports. Decoration. Ceramic tiles are a wonderful way to bring beauty into your home. From decorative borders to murals of painted tiles, there are numerous ways to use ceramic tile as a decorative element. Plus, you can often place ceramic tile designs where no other decoration will fit. For instance, why not install patterned ceramic tiles on the risers of your staircase? Countertops. Tile is a wonderful material for kitchen and bathroom countertops, as it is heat-resistant and able to stand up to spills. In years past, small ceramic tiles were used on kitchen countertops. Now, the vogue is to use large ceramic tiles. This cuts down on cleaning time, since there is less grout where grime can stick. 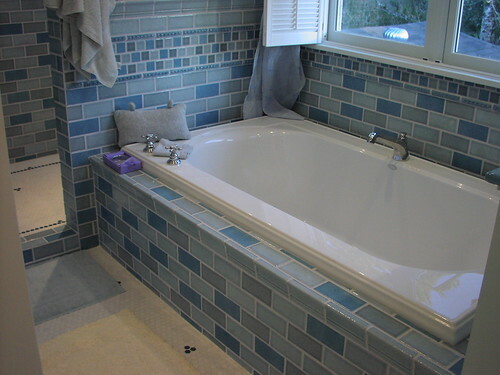 To accentuate the color of your tiles, consider using a colored grout. Additionally, colored grout hides dirt. Bathroom tile installation is especially tricky, since bathroom countertop surfaces are often small enough to require cutting tiles. Again, find an expert contractor to help you with ceramic tile installation. Backsplashes. The backsplash behind the kitchen stove is one area that demands high durability, and ceramic tile is the perfect solution. It is easy to wipe off with soap and water, and it won’t crack or fade, even after years of splattered sauce. Moreover, the backsplash is a wonderful place to create a unique ceramic tile design. To unify the entire kitchen, extend the backsplash design on surrounding walls, like a ribbon tying the room together. Walls and Wainscotting. Shower walls are a great place for tiles, because tile is not affected by moisture. Actually, people install tiles on a variety of walls. For instance, because ceramic tile will never need to be refinished, it’s a great way to protect that new paint job. Tiling a wall up to the chair rail will help keep your home renovation looking new for years to come. It’s much easier to clean tile than it is to repaint an entire room. Whatever application you choose, find a knowledgeable local contractor to help with the ceramic tile installation. That way your ceramic tile design will look like new for decades to come.